We apologize for for the lack of reports this fall. From guiding almost every day through late October to a trip to Idaho we have been very busy. Late September and October provided some of the best fall fishing we have seen on the Androscoggin River. We saw more wild rainbows over 15" this fall than we have ever seen! A warmer than usual September and October kept hatches of BWO's and Isonychia mayflies consistent through late October. Things changed with two big rain storms at the end of the month. Lucky for me I was in Idaho enjoying ideal conditions on the South Fork of the Snake river! Typical October dry fly fish. Androscoggin River Brown...a good one. South Fork of the Snake River fishing with Teton Valley Lodge Guide Milan Krainchich. We have been out a couple times since returning from Idaho. 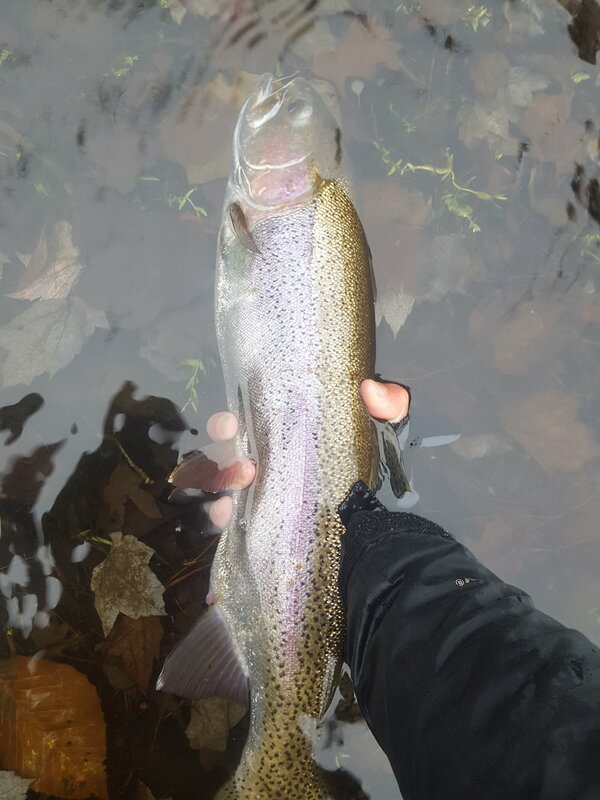 We had a good streamer bite last Monday when temps were in the 60's with clouds and a light rain. Fishing has slowed a bit more recently as the coldest temps of the season are upon us. Fishing should improve next week as the fish acclimate to this colder weather. We are going to head out in search of some bigger browns next week and we'll let you know what we find. We still have dates available for our Arkansas trips this coming March of 2018. If you are interested in getting spring started early chasing trophy browns, rainbows and cutthroat please let us know asap as dates are filling fast. Guiding dates are from March 7- March 31st. This is prime time on the White and Norfork rivers! Last year was epic with 50-100 fish days and 18"-22" fish landed nearly every day. An Average Norfork River Rainbow.